Everybody is welcome at the all singing, all dancing Melbourne Jazz Jammers annual Xmas Breakup Party at the Leinster Arms Hotel on Sunday 2nd Dec from 12noon till late afternoon. Don’t worry if you can’t dance or sing as you will be in good and similar company. I am informed that as in past years formal attire suitable for such an august occasion (in December) will be required. Undoubtedly Santa will bring his trombone and party hat. I am also informed that there will be a special surprise (which should be regarded as separate and distinct from a fairly ordinary surprise) at this event. Well, these days, it is hardly news, is it? Pleasant little excursion up Punt Road, Bob on the reminisce and all is well with the world.. strolled into the Gold Street Sheltered Workshop to find the first stanza under way, Melinda laying down the beats, the Captain soloing, some dude playing flugelhorn in between being disgruntled at this that and the other. When gruntled, he played rather well…. All sorts of people turned up as the Arvo wore on – the sublime Sarah taking several years off Todd’s piano playing career by accidentally exposing him to the full horror of a dysfunctional jam session band, with its choice of tempos and arrangements, and guitar backing laid over rather than under everything… Poor Todd, visibly shaken, retired to the back bar to recover, which he did with the aid of strong drink and sympathy – after we cleared out the backing band they cooked up a storm later on. Which should have been the highlight of the Arvo, only Agus came along and conjured up a rippin’ version of So What, well accompanied by Adam (bass) Denis (drums) and the Captain in fine form. Which should have been the highlight of the afternoon, and , for me , was..
All of which means, I am not going to mention Kay, Gentleman John C, is Don is good, Jack the Invisible, Sam on mini sax, happy Trevor, POCKOTL, Scott, Rusty Pete etc etc. Consider yourselves all unmentioned, and in some cases, unmentionable. But that is another story. Ya wouldn’t be dead for quids. 7:30pm $28/25 conc + bookings of 6 or more. hallucinogenic screams, subtle nuances and theatrical appearance. the spine.” John Shand, Sydney Morning Herald. some new pieces handpicked especially for this show. They will be accompanied by the remarkable Adam Rudegeair on piano. as Australia has ever had the honour of laying claim to.” Lo Carmen, Collapseboard. Elly Hoyt is a rising star in the Australian Jazz Scene, as singer, songwriter and musician. on November 24th. With her onstage will be John Montesante (trumpet/flugel), Scott Lambie (drums), Dean Addison (double bass) & Joe Ruberto (piano). Come and experience one of Australia’s future jazz greats. That’s the Tuesday after Cup Day so ….. plenty of time to recover from whatever you’ve won or lost on the cup and get your frocks on again to come to Dizzy’s. for a great night of jazz. The line up includes the wonderful Neil Taylor on piano, David Taylor on bass, Allan Smith on drums and Barry Boyes-Smith (I’ve asked him to change his name!!!) on saxes …a great bunch of musos to warble with! I’m delighted to have the opportunity once again so hope you can make it on the night. Dizzy’s 381 Burnley St Richmond. Hope to catch up with you there! Kay, Captain, Andrew Lye and meself played a rippin’ little set for the Melbourne Cup breakfast on Tuesday. This week, Chelly Parisi turns up the wick on Friday night, and Michelle Gigliotti revives some early blues and jazz standards on Saturday. God knows what happened at the Leinster this week, I wasn’t there, and she’s not telling. I am unreliably informed that Frank the Indefatigable ran a tight ship, and a good time was had by all. Not easy with so mjany regulrs away, so Mr F is to be plied with sympathy and strong liquor next time he turns up. While the Captain was holidaying with Hortense in Wangaratta, we had our last Sunday at Bar Oussou. On Monday, we headed up to Lake Mountain, playing the Gala Dinner at the awards for the best sparkling wines in Australia. A gourmet dinner for 150 guests with the best sparkling wines – it was quite a night! For the first time, I was asked to turn DOWN the guitar! There are some pics at: http://www.jazznotes.net.au . Over the next few weeks, we’ll consolidate and expand our repertoire. But, if you hear of anyone who might like to engage a band, we’re available! 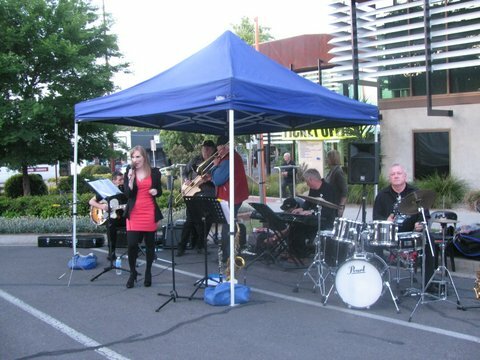 The Nicole Thorne Trio is one of Victoria’s most celebrated modern jazz groups. They perform jazz standards in new ways, featuring wonderful interactions between Nicole on keyboards, Eiji Takemoto on bass and Graham Morris on drums. Summer Swing Smackdown at the Melbourne Lindy Exchange! The Summer Swing Smackdown is one of the most exciting swing music and dance productions to grace Australia’s stages in recent years. HMS PopUp Productions is bringing this spectacular show to Melbourne. In an epic event not seen since the Savoy years, four premier Australian swing bands will go head-to-head – each performing in an exciting boxing ring battle. The bands face each other on four sides of a huge dance floor, playing song for song in a fast-paced musical shootout. Dance teams from four different states will also compete for the coveted Summer Swing Smackdown Champion’s trophy through stunning dance demonstrations, to the live sounds of their chosen band. Three of Melbourne’s best and brightest, Andrew Swann and his Swingin’ Assassins, The Barrelhouse Dreamers, Loni Rae and the Martinis and Adelaide’s premier swing band, The Lucky Seven, will be brought together by HMS Pop-Up Productions to face off in this incredible showcase. The inaugural Summer Swing Smackdown, staged in Perth, sold out two weeks before opening and tickets became a rare commodity as music lovers and dancers alike vied for precious spaces at the table of Perth’s Swing royalty. This special event, a travelling showcase of spectacular swing talent, will delight Melbourne audiences just as it did Perth punters! This will be the first time these talented jazz, swing and blues musicians have met in one incredible line-up, at St Kilda Town Hall, and it will be an event not-to-be-missed. Dance demonstrations, saucy cigarette girls and the crowd pleasing antics of HMS PopUp Productions’ marvellous Mistresses of Ceremonies, The Captains Three, make this once a year spectacular the swing scene’s night of nights. Throw on your gloves, throw off your robe and let’s get ready to rumble!